L.I. #1 SERVICE & REPAIR DEPT. Sign Up Today to Receive New Products, Specials & Discounts from Thomas Grimaldi Billiards! 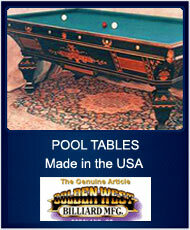 Thomas Grimaldi Pool Tables & Game Room carries a large selection of Pool Tables. We carry many different high quality pool table brands such as Connelly Billiards, AE Schmidt Billiards, Golden West Billiards, and Imperial Billiards. Stop by our Showroom located in Farmingdale, Long Island or call us at 631-454-7665. 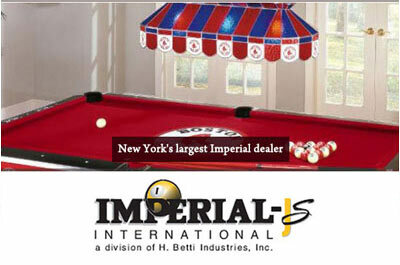 Thomas Grimaldi Pool Tables & Game Room carries a large selection of Outdoor Pool Tables. 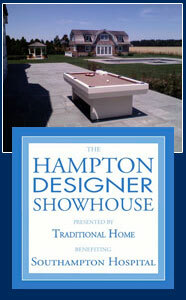 We carry many different high quality outdoor pool table models from Gameroom Concepts Unlimited. Stop by our Showroom located in Farmingdale, Long Island or call us at 631-454-7665. 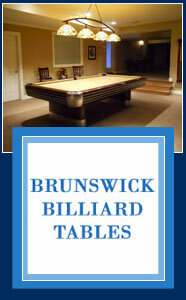 Thomas Grimaldi Pool Tables & Game Room carries a large selection of Game Tables. We carry many different high quality game table brands such as California House, Imperial International, and Berner Billiards. Stop by our Showroom located in Farmingdale, Long Island or call us at 631-454-7665. Click here for more information. Thomas Grimaldi Pool Tables & Game Room carries a large selection of Poker Tables. We carry many different high quality poker table brands such as California House, Imperial International, and Berner Billiards. Stop by our Showroom located in Farmingdale, Long Island or call us at 631-454-7665. Click here for more information. 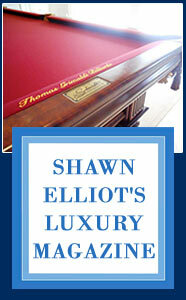 Thomas Grimaldi Pool Tables & Game Room carries a large selection of Game Room Furniture. We carry many different high quality game room furniture brands such as California House, Imperial International, and Ram Game Room Products. Stop by our Showroom located in Farmingdale, Long Island or call us at 631-454-7665. 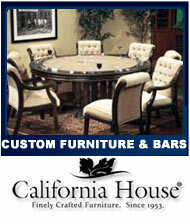 Thomas Grimaldi Pool Tables & Game Room carries a large selection of Custom Home Bars. 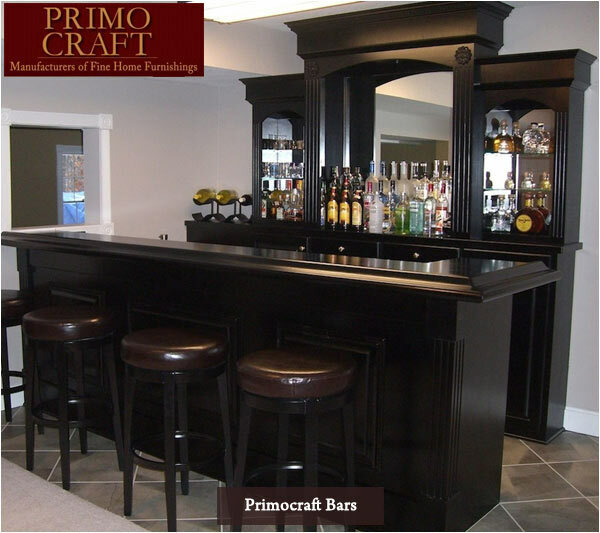 We carry many different high quality custom home bar brands such as Primo Craft and California House. Stop by our Showroom located in Farmingdale, Long Island or call us at 631-454-7665. Thomas Grimaldi Pool Tables & Game Room carries a large selection of New Arcade Games, Classic Arcade Games, and Pinball Machines. We carry the Classic Arcade Games like Ms. Pacman, Donkey Kong, Astroids, Centipede, and much more... Stop by our Showroom located in Farmingdale, Long Island or call us at 631-454-7665. 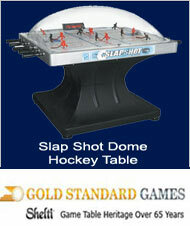 Thomas Grimaldi Pool Tables & Game Room carries a large selection of Air Hockey Tables and Domed Hockey Tables. 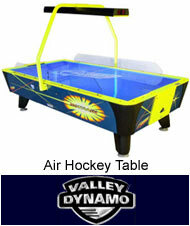 We carry many different high quality Air Hockey Table and Domed Hockey Table brands such as Shelti and Valley Dynamo. Stop by our Showroom located in Farmingdale, Long Island or call us at 631-454-7665. Thomas Grimaldi Pool Tables & Game Room carries a large selection of Foosball Tables. 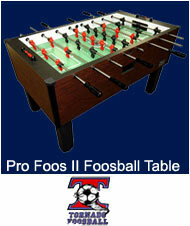 We carry many different high quality Foosball Table brands such as Shelti, Tornado and Valley Dynamo. Stop by our Showroom located in Farmingdale, Long Island or call us at 631-454-7665. Thomas Grimaldi Pool Tables & Game Room carries a large selection of Shuffleboard Tables. 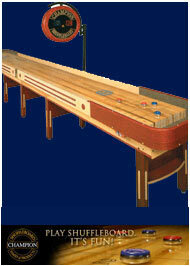 We carry many different high quality Shuffleboard models from Champion Shuffleboards. Stop by our Showroom located in Farmingdale, Long Island or call us at 631-454-7665. Thomas Grimaldi Pool Tables & Game Room carries a large selection of Ping Pong Tables. 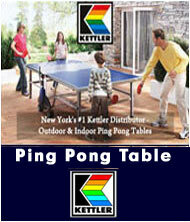 We carry many different high quality Ping Pong Table models from Kettler. Stop by our Showroom located in Farmingdale, Long Island or call us at 631-454-7665. Click here for more information. Thomas Grimaldi Pool Tables & Game Room carries a large selection of Outdoor Ping Pong Tables. We carry many different high quality Outdoor Ping Pong Table models from Kettler. Stop by our Showroom located in Farmingdale, Long Island or call us at 631-454-7665. 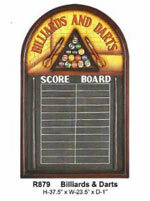 Thomas Grimaldi Pool Tables & Game Room carries a large selection of Pool Table Accessories. We carry many different high quality Pool Table Accessories from Cue & Case and CueStix Billiard Supplies. Stop by our Showroom located in Farmingdale, Long Island or call us at 631-454-7665. Thomas Grimaldi Pool Tables & Game Room carries a large selection of Pool Table Accessories. We carry many different high quality Pool Table Accessories from Cue & Case, CueStix Billiard Supplies, Bababushka, Cuetec, Joss Cues, J. Pechauer Custom Cues, McDermott Handcrafted Cues, Meucci Cues, Poison Cues, Predator Cues, and Viking Cues. Stop by our Showroom located in Farmingdale, Long Island or call us at 631-454-7665. 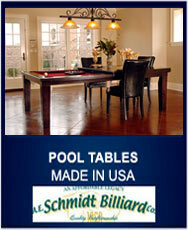 Thomas Grimaldi Pool Tables & Game Room carries a large selection of Pool Table Lighting. We carry many different high quality Pool Table Lighting from Ram Gameroom Products and Toltec Lighting. Stop by our Showroom located in Farmingdale, Long Island or call us at 631-454-7665. Thomas Grimaldi Pool Tables & Game Room carries a large selection of Game Room Lighting. We carry many different high quality Game Room Lighting from Ram Gameroom Products and Toltec Lighting. Stop by our Showroom located in Farmingdale, Long Island or call us at 631-454-7665. Thomas Grimaldi Pool Tables & Game Room carries a large selection of steel-tipped darts, soft-tipped darts, regulation bristle dartboards, electronic dartboards, dartboard cabinets, and darts accessories. We carry many of the world's top darts brands. Stop by our Showroom located in Farmingdale, Long Island or call us at 631-454-7665. Thomas Grimaldi Pool Tables & Game Room carries a large selection of Wall Decor for your Billiard Room, Game Room and Man Cave. We carry many different high quality Wall Decors from Ram Gameroom Products such as Billiard Signs, Billiard Posters, Wall Racks, Wall Clocks, Neon Signs, Neon Clocks, Billiard Artwork, Outdoor Wall Decor, and much more... Stop by our Showroom located in Farmingdale, Long Island or call us at 631-454-7665. Click here for more information. THOMAS GRIMALDI POOL TABLES & GAMEROOM INC.